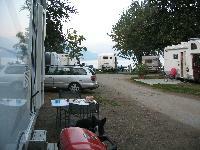 Private camp site on the shores of Lake Maggiore. Small pitches for large outfits. One of the very few sites to have a private beach and marina on site. Expensive compared to the Sosta further into town but very secure, lots of facilities, including a doggy shower to wash down pooch after he/she has been in the lake. Excellent bar/snake bar with small shop. Laundry facilities. If entering Cannobio from the North, its the first place you come to on the left. Town centre is a 10 minute walk along the lakeside.